Fripp's Only Beach Villas; Best Rates for August. Book Online! Our 1500 square foot villa offers a fantastic view of the Atlantic Ocean from the second floor deck. The uncrowded beach is just a short walk across our quiet courtyard and boardwalk! The living room includes sofa and love seat, breakfast table and entertainment center with 42' flat-screen TV, blue-ray DVD player, and stereo/cassette/CD player. The laundry area is conveniently located within the villa. The kitchen is fully equipped with dishwasher, range/oven, and microwave. The adjoining dining room provides another spectacular view of the Atlantic. Sleeping arrangements are: one king-size bed and one twin bed in the upper floor master bedroom, one queen bed and one twin bed in one of the main floor bedrooms, two twin beds in the other main floor bedroom, and two twin beds in the den off of the living room. Each of the three bedrooms has its own full bath. Our central location puts you within walking distance of pools, fitness center, specialty shops, fine dining at The Beach Club Restaurant, Food Court, and the Racquet Club's ten tennis and pickle ball courts. Ocean Point Golf Links to the north and Ocean Creek Golf Club to the south are each less than 5 minutes away. The full-service marina complex provides launching, docking, fuel, charter services, and the Marina Store. Rental golf carts, mopeds, bicycles, fishing boats, kayaks, and paddleboards are also available. The Bonito Boathouse Restaurant offers family fare with fantastic sunset views from the roof top dining room. No visit is complete without an excursion boat ride on The Fripper II pontoon boat. The Cabana Club at Veranda Beach has three pools, Willie's Wet Bar, and Sandals Bar & Grill. Camp Fripp offers daily summertime children's activities for ages 3 through 12. Additional nature and social programs are scheduled for the entire family. Davis Love Park has a playground, basketball court, volleyball court, and the shrimp boat. An unlimited number of Fripp Island Resort Guest Cards may be purchased that allow access to all island amenities. Please ask us for details. A tour along the off-road bicycle trail reveals an abundance of deer, low-country birds, and other wildlife. You may even see one of our lazy gators. What you won't see are fast-food or fast cars; neon lights or traffic lights. For your safety and protection, there is a 24 hour gate with security force, fire, and paramedic services. Fripp Island is the complete vacation for complete relaxation. You'll come for a week and come back for a lifetime! Check our calendar below. If we don't have the dates you need, please contact us anyway. We'll be glad to help you find similar villas; we especially recommend our friends and neighbors at #579609, and #19988. Don't leave without clicking on our personal web page below to see photos of our villa and other cool Low Country stuff (along with the dancing Beach Babies)! 'The location, the view, having our family together - it was a terrific week. We hate to leave. Thanks for sharing your villa. Our family has been coming to Fripp for over 25 years. We're a group of three families from southwestern Ohio. Some of us are retired; others only dream of being. We've been making the twelve hour trip to Fripp for 30 years. We Eat This Stuff Up! It's a quiet seaside gated community free of theme parks and outlet malls. The Captain John Fripp Villas are the ONLY villas on Fripp Island connected directly to their own full-time beach (no loss of beach at high tide). The island abounds with wildlife; deer, alligators, and a wide variety of birds including heron and osprey. All three bathrooms are adjacent to bedrooms with tub/showers. Wide open view from our second floor deck. Beach is just a 60 yd walk across our courtyard. Central Air. One of the bedrooms has thru-the-wall air conditioner/heat pump. Heat pump with auxiliary heating elements incorporated into central air system. One of the bedrooms has thru-the-wall air conditioner/heat pump. Sheets, pillow cases, and blankets are provided. Bath towels, hand towels, wash cloths, dish towels, and dish cloths are provided. Guests provide their own beach towels (and beach chairs). FREE in villa 10 mbps DSL. New standard microwave oven mounted above range. 42' flat-screen TV in living room. 32' flat-screen TVs in the master, courtyard, and parking lot side bedrooms. Standard cable TV service connected to all living room and bedroom TVs. Blueray DVD in living room and master bedroom. DVD/VHS player in parking lot side bedroom. A large variety of books are available to check out from the Community Centre Library for 25 cents each. A variety of videos are available to check out from the Community Centre Library for 25 cents each. Half-acre landscaped courtyard with sidewalks. Ideal place for children to play within sight of parents. Great place for large groups to socialize. Fripp Island Racquet Club is directly across the street. Pickleball too! 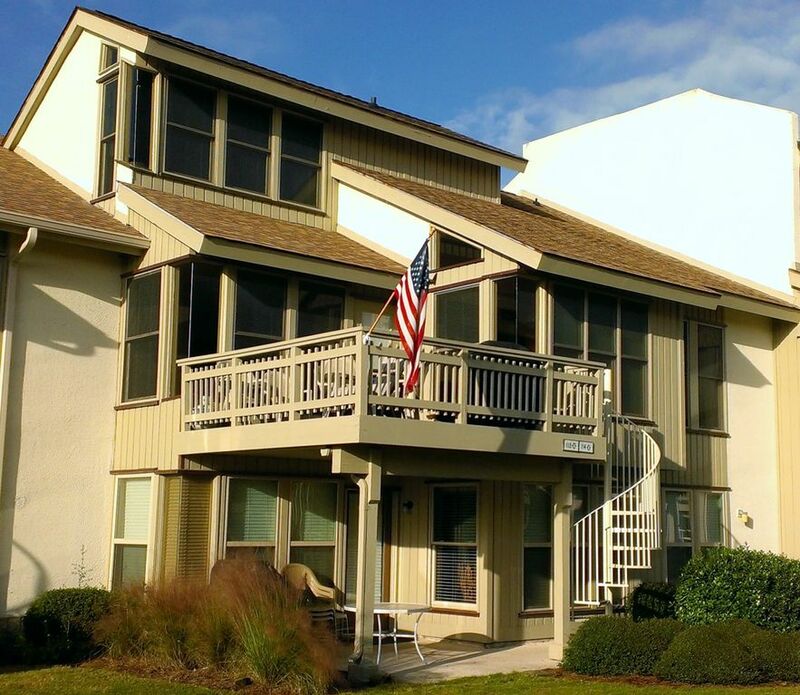 Ocean Point and Ocean Creek Golf courses are each within 1.5 miles of the villa. Several other local public courses are with a 30 minute drive. Guests provide their own paper and soap products as well as beach towels and beach chairs.